So you are forced to run the installer, accept the OpenCandy license agreement, view ads, potentially get unwanted software installed, have the OCSetupHlp.dll left in your system and you call this fine? For me this is not fine at all so I am stuck to version 7.9. More, as far as I know if one copies FreeFileSync portable folder (versions 8.0 & 8.1) from one device to another it will not run. Agreed, it is totally not OK, as indicated above, users are forced to run the installer to update or "install" on different machines... I will pass. So folks here know as well, I attempted to standardize the technique of using a process breakout, either command line or otherwise, to get around the dreaded "Cannot open file GlobalSettings.xml. Error Code 32" issue that occurs on many PCs whenever launching FreeFileSync 6.3 and up from other processes (menus, third party file managers, schedulers, etc) so that everyone could use FreeFileSync 7.9 on every PC. Unfortunately, though it worked on some PCs, it did not work on others. You can download FreeFileSync Portable 7.9 Dev Test 4 from the forum topic on PortableApps.com here if you're curious: http://portableapps.com/node/54695 All source code is included if you'd like to check it out as well. I attempted to compile the FreeFileSync code myself but as there are no build environment instructions, I wound up hitting a wall. Also of note, I took a look at the FreeFileSync 8.x code and it does not appear to contain the requisite code to interpret the install.dat file that causes issues with moving FreeFileSync between relative paths (DropBox, etc). This means that FreeFileSync 8.0 and up is no longer a fully GPLed app and the binary must be considered freeware only. So, while the source for the majority of the app is available under the GPL, any claims that the 8.x binaries being distributed are licensed under the GPL are factually false. FreeFileSync 7.9 appears to be the last properly open source release. Following from that, if FreeFileSync is using any code from third parties or patches submitted by other developers under the GPL and the publisher has not gotten their express consent to license it under a proprietary license, then FreeFileSync is in violation of the GPL and, thus, the copyright of the third parties. GPL code can not be compiled into a binary with code that is not GPL compatible and distributed. I do not know whether or not FreeFileSync includes code written by anyone other than the publisher, so this may not be the case. JohnTHaller wrote: This means that FreeFileSync 8.0 and up is no longer a fully GPLed app and the binary must be considered freeware only. So, while the source for the majority of the app is available under the GPL, any claims that the 8.x binaries being distributed are licensed under the GPL are factually false. If true, this wouldn't surprise me at all. I'm really tired of dealing with this program on the site, so I didn't hesitate in adding yet another cautionary note to the program. JohnTHaller wrote: Following from that, if FreeFileSync is using any code from third parties or patches submitted by other developers under the GPL and the publisher has not gotten their express consent to license it under a proprietary license, then FreeFileSync is in violation of the GPL and, thus, the copyright of the third parties. GPL code can not be compiled into a binary with code that is not GPL compatible and distributed. I do not know whether or not FreeFileSync includes code written by anyone other than the publisher, so this may not be the case. That follows. I hope this is resolved clearly or leads to a program fork. Whichever unwanted offer is bundled with the installer now consistently crashes said installer on my computer, unless I completely unplug the computer from the network before launching the installer. I love the program on principle, but that kind of garbage behavior makes it difficult to support the author at all. Erkhyan wrote: ... that kind of garbage behavior makes it difficult to support the author at all. That doesn't surprise me. There are a few programs on the site that just don't seem to care about the user experience and it wouldn't bother me at all if we took them offline. FFS is one of them. Woah. Although I stopped using FreeFileSync, today I decided to use it for a friend by actually installing it. Going through the install process, I found out that starting with version 8.7, you have to pay to use the program in portable mode. In addition to the fact that many people have issues with the portable method not working consistently or at all, now that you have to pay for it is just... I don't know what to say. This is addition to the fact that "donating" only works for the current version you donate too (basically you have to donate each time a new version comes out). He might as well just sell it. At least that would be honest. It's funny though. I easily dropped $20 and planning on dropping another $40 for Bvckup2. Yet I have not and never will bother considering about "donating" to FreeFileSync. Thank you for the information, I was not aware if this new outburst of greed. Did it occur to you to take a screen-shot? What does actually happen? When you try to install it in portable mode FreeFileSync asks you to pay?! I still have FreeFileSync version 7.9 which is still working fine. Have you tried SyncBackFree which is not very portable? It has already been discussed in the forum. Do you know what is Bvckup 2 upgrade policy? Free updates for minor versions? One year of free updates? Lifetime free updates? No free updates? Thank you for your express response and for the screen. About portability- have a look at tproli's post. Thank you very much for the guidance about the portability of SyncBackFree! It will now be on my USB at all times with my other various portable tools. The installer is now ad-free! This is also mentioned in the FAQ. 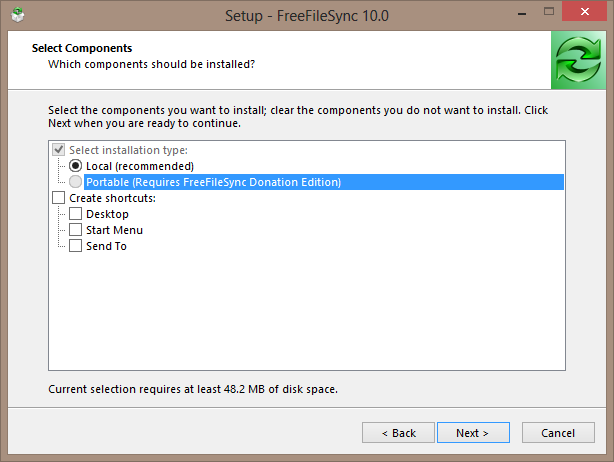 In short- one cannot use the portable version without donation so FreeFileSync is not freeware. Great news and good riddance.